If you just know a little bit of what Mallorca has to offer you also know how many fantastic photos there is to be found, taken anywhere on the island. Found a group on Flickr with Mallorca photos only and it seems to be updated quite often. Somthing to have a look at when your next trip to Mallorca is too far away. Golf is very popular in Majorca. Not only is the weather great almost all year round, you will also find plenty of great golf courses around the island. Most of them have their own webpage, will list them in the catalog soon enough. But for now you can start by visiting one of these webpages that covers most of what you need to know about golfing in Mallorca. For you who are interested in running a marathon in Majorca you should check out the TUI Marathon website. the Marathon is held every year in Palma, normally in october, and is a very popular event.This year a total of 8,368 runners and children participated. Found an article at majorca.info saying that of all destinations Mallorca and Palma is where most britons hire a car for holiday. If this is the case you probably know about most care rental places already, but if not here are a few present online. 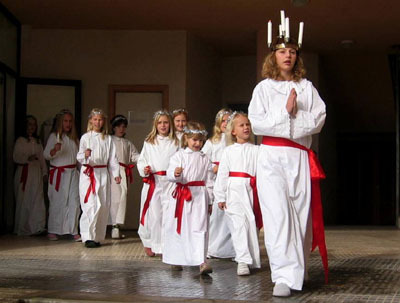 One of the most swedish traditions you will come across here in Majorca is the celebration of Santa Lucia. Every year on December 13 the students from the swedish school in Palma sings christmas songs in Placa Cort. The swedish church also attends and offer swedish treats such as Glögg (warm wine with spices) and ginger cookies. If you haven’t seen it before you should go there this year! The biggest shopping centre in Palma is Porto Pi, located west of palma city close to Cala Mayor. To get here by bus you can take bus number 1, 3, 20 or 46. The centre has tons of clothing stores for all ages, some furniture and interior design stores, groceries in carrefour, restaurants and cafés and even a cinema. And, after many years of no having no information at all on the web they are now finally online with their own webpage. Thinking of starting year 2011 with some culture then you should see the moscow ballet in palma 3rd or 4th of January. Today was a bank holiday here in Spain, it is the constitution day. This day has been celebrated since the Spanish people adopted the National Constitution on december 6th 1978. If you are interested to know more in detail go to wikipedia. Since everything is closed I will spend it visiting the christmas market in Pueblo español in Palma. I have learned it costs 4 euros to enter and that you will get a gluhwein, warm wine with some spices. It was not long ago I first heard about the fabulous bread from fibonacci. A bakery in ciudad jardin that sounds nothing but italian but seem to have norwegian owners. After i heard about them i had to try and it was indeed really good bread they had to offer, along with all sorts of delicious pastries. A while later they opened a café in portixol and just a few weeks ago they also have a café in santa catalina in Palma. Well worth a visit if I may say!